William S. Hart plays the male lead in the ca. 1898 Chicago production of "Romeo and Juliet," which called on Hart to make five costume changes. "The material did not seem to be like ordinary costume goods at all," Hart writes in his 1939 autobiography, My Life East and West. "Everything was thick, heavy silk, beautiful cloth and fine brocades. It seems to me that the costumes alone would have played the parts." Hart filled out Romeo's costumes to critical acclaim. In his autobiography he includes a review from critic Amy Leslie: "William S. Hart played Romeo from a purely romantic standpoint of youth and fiery impetuosity. He did not grow old in the night of agonies thrust upon him, but was a boy through it all, quite to the very end. His Romeo is not matured by tragic sufferings. Some moments of Mr. Hart's Romeo were most real and all of it was sympathetic and graceful." Well, except for the part where he got caught on stage guzzling a bottle of beer during the parting scene on opening night. It seems he had instructed a stage hand to fetch him a beer for after the show. Eager to please, the quick-heeled boy returned too hastily, handing Hart the open bottle just as the actor got his cue. "I was only human," Hart writes. "Down my throat it gurgled." "How we finished the scene I do not know. I only know that I expected surely to be discharged. A production that cost a fortune  the opening night  the star's big scene! For any sane man to do such a thing was beyond all reason. The damned bottle was still foaming and still clutched in my right hand. I spoke my last line as we passionately kissed  'Dry sorrow drinks our blood. Adieu! Adieu!'" "God! It was terrible  but it was funny! I changed into my last-act costume and after the curtain fell went to Miss Arthur's dressing-room to apologize and to be discharged." 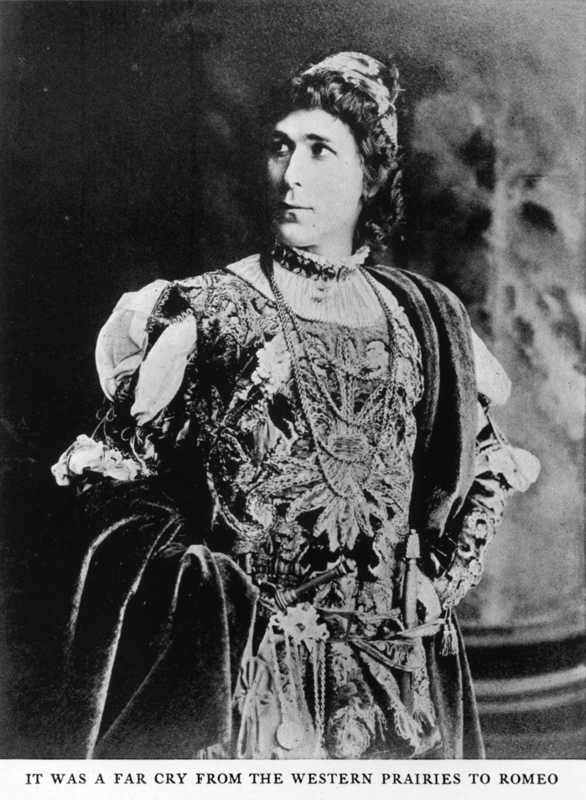 (Julia Arthur, a big-name star, played Juliet.) "I knocked ... the door was opened. There she stood in all her glorious beauty, her dark eyes dancing, her husband beside her. She looked at me  but she spoke to him, 'And Ben, you don't know the worst of it  the selfish beast! It was a QUART BOTTLE!!'" Next to come for Hart was Klaw and Erlanger's original Broadway production of "Ben-Hur" in 1899. Image and caption from "My Life East and West" (1939). LW2241: 9600dpi jpg from book page.